ATLANTA (Reuters) - The U.S. Federal Reserve should try to make its communications on the expected path of interest rates more consistent with its policy statements, a top official at the central bank said on Wednesday. Dennis Lockhart, president of the Federal Reserve Bank of Atlanta, said the Fed's most recent projections for interest rates had been out of step with its pledges on policy. "It seemed to be inconsistent with the underlying decision of the committee and the underlying guidance," Lockhart told reporters in Atlanta, adding that he still feels the U.S. economy is strengthening quickly enough for the Fed to raise rates in the second half of 2015. The Fed issues a quarterly graphic that shows the level at which policymakers see the central bank's benchmark interest rate over the next few years. In March, that graphic suggested the average policymaker expected the central bank would raise rates slightly more aggressively than in previous projections. But in a policy statement that accompanied the graphic, the Fed said it would keep rates lower than normal for a few years. 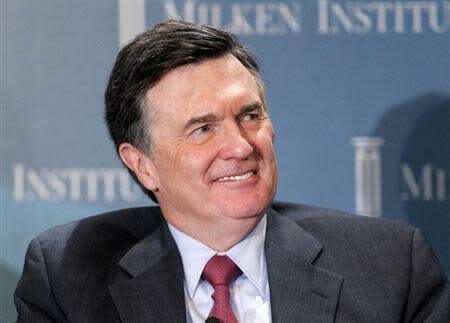 Lockhart said it would be useful to identify which projections on interest rates were from policymakers who are currently voting members of the Fed's policy-setting board. "Clearly, some way of coordinating that so that there is consistency would be preferable to what happened recently." Lockhart does not have a vote this year on that board but he participates in its discussions and is considered to be near the center of the central bank's policy spectrum. He said recent economic data was reinforcing his view that the economy was on track to strengthen significantly in the second quarter of this year.